How much do you love zucchini? Let me count the ways! At least a million recipes can be prepared to use up those overly multiplying green monsters in the garden! And one that I know that you’ll love is: Crispy Garlic Parmesan Zucchini Chips with Roasted Garlic and Basil Aioli! Recently I came across a recipe that I adapted from Closet Kitchen. I made several adjustments to really make the flavors sing more robustly. I used Italian-flavored panko instead of regular, unflavored panko. I added garlic to the breading and made my version of aioli for dipping the zucchini chips. What I came up with is a nice appetizer, Crispy Garlic Parmesan Zucchini Chips with Roasted Garlic and Basil Aioli! And just what is ‘aioli’? Well, it’s a fancy name for garlic-y mayonnaise! This aioli recipe is made easier with ready-made mayonnaise or you could use your own home-made mayonnaise. I added some roasted garlic to amp up the flavor and wow, what a difference it made! Peel any loose outer skins from the garlic head and cut off the top quarter to expose the cloves. Place the head cut-side up on a piece of foil, drizzle with 2 teaspoons of the olive oil, and wrap tightly to form a foil packet. Place on a baking sheet and bake until the garlic cloves are golden brown and very tender, about 60 to 75 minutes. Remove from the oven, open the packet, and let the garlic sit until it’s cool enough to handle. Squeeze the roasted cloves from their skins into a small bowl. Easy to make, ready to share in less than 20 minutes, and when served hot, these zucchini chips are a great veggie treat that are fun to eat with their super crispy texture! The color of these zucchini chips is so gorgeous! Coat zucchini slices in flour, gently patting down so the flour sticks to the zucchini chips. Dip the coated zucchini chips in eggs. Then dredge the zucchini chips in the panko crumbs mixed with parmigiano reggiano cheese, garlic powder, lemon zest and salt and pepper. Fry the coated zucchini slices in oil until lightly golden brown, about 2-3 minutes per side or place them on a wire rack on a baking pan, spray lightly with oil and bake in a preheated 425 F oven until lightly golden brown, about 15 minutes. Allow fried or baked zucchini chips to set on paper towels for a minute to remove any excess oil. Blend the mayonnaise, minced roasted garlic, lemon juice, and basil. Salt and pepper the zucchini chips and serve with the basil aioli while hot. Enjoy these Crispy Garlic Parmesan Zucchini Chips with Roasted Garlic and Basil Aioli. All I can say is this looks wonderful and I can’t tell you how many new ways I have been cooking up zucchini this summer…what a fantastic veggie…it’s so versatile! I grew the Romanesco variety which I love…maybe it’s the stripes and the fluted edges when cut into rounds! Looking forward to making this one! Don’t you just love cooking with zucchini Phyllis? Thanks for stopping by and hope you’re doing fantastic! I wasn’t going to grow any this coming summer Roz…duh…gave my head a shake! They is just so many things that you can cook and now, don’t think I could do without! And will be trying them out in a different location this year! I love being able to go outside and get dinner, don’t you! Grazie Chiara! Your comments always make me smile! They look WONDERFULLY delicious and healthy as well, Roz. Definitely were tasty little things, and certainly better for our health than potato chips! Cheers to good health! Roz, I can remember the first time I tasted a crispy zucchini chip (which was a very long time ago) and I have to tell you this is the first recipe I’ve ever seen that resembles it. Thank you! Oh my gosh, Sam . . . what a compliment. You would know too, with your culinary experience and background. I’m humbled and honored! I am going to try these the next time I have my grandsons over to see if I can get them to eat zucchini 🙂 I know my husband and I will gobble them up if they don’t 🙂 Great recipe, Roz! 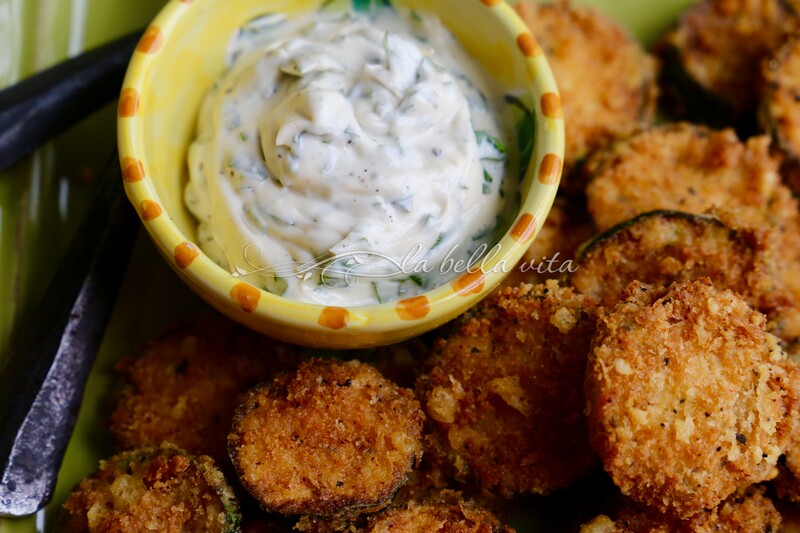 I think that your grandsons would really like these zucchini chips Susan! Oh how I wish I had more zucchini in the garden. But it’s all finished for the season. I will have to get some at the farmer’s market and make this wonderfully mouth-watering recipe. I bought these zucchini from the farmers’ market too, Linda. My garden is totally exhausted for the year and I’m hoping to have the time to plant winter veggies and leaf lettuce. Thanks for stopping by! Oh MY goodness these CHIPS sound so GOOD ! We can eat the entire dish. And, love the basil aioli dip next to it- heaven! I hear ya! We ate the whole plate too! Eat them while they are hot! Love zucchini and these chips look delicious. I pinned them for later. 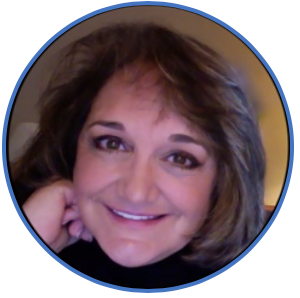 I hope you enjoy them Annamaria; please let me know what you think! 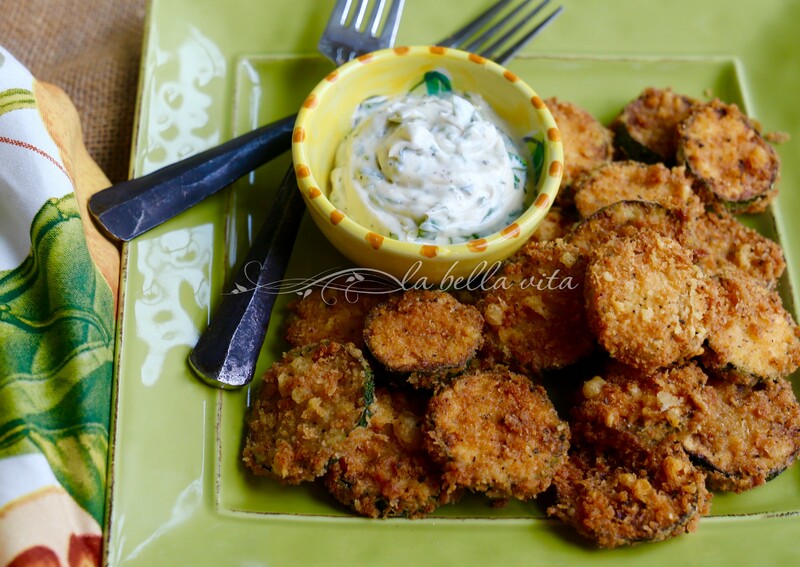 This looks like the best recipe for fried zucchini that I have ever seen! And I love sauces to dip veggies in. I recently had aoli at a restaurant and it was amazing. I’m so glad to get your recipe. Thanks for another great recipe, Roz! This is my kind of heaven right here. I bet it would be delicious made with eggplant, too! Yes, I agree Mindy, this would be a great way to prepare eggplant! If you were to set this plate in front of me right now, I would eat it all! These look quite delicious and so crispy, sometime I have a hard time with whenever I’ve made squash chips.